An official opening ceremony at Douglas Park School has brought to 12 the number of “pou” in the streets of Masterton designed to give parents a drop-off and pick-up spot for students away from schools, secure in the knowledge that there is a safe route to school. 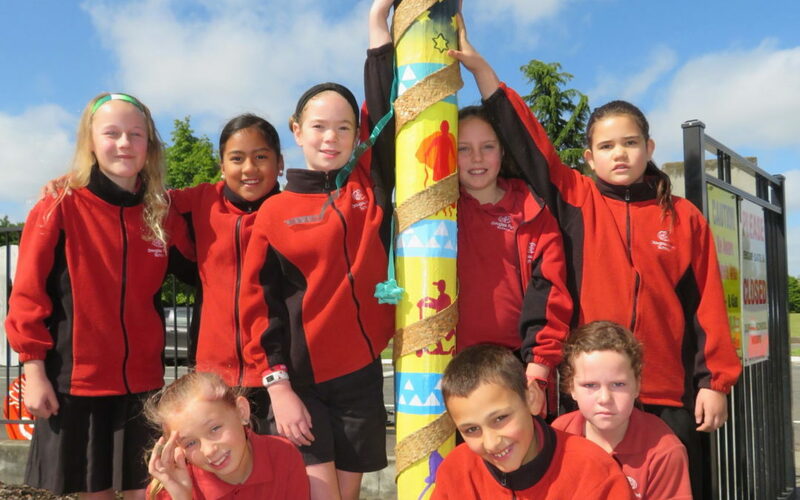 Pou is te reo Maori for post, and the concept has already seen pou erected on routes for students of Masterton Primary and Fernridge schools, with pou planned for Masterton Intermediate. The Douglas Park pou were made by 14 pupils in the school’s Enviro Team, under the guidance of Michelle O’Connell, who said the designs developed by the students incorporated the Maori concepts of papatuanuku, the land, and ranginui, the sky, as well as the Tararua Range, and modes of transport from the past to the future. Holly Hullena, from the Wairarapa Road Safety Council, the pou idea had several benefits. “We’d want to reduce the congestion on the roads outside schools at pick-up and drop-off times, when students can be hard to see. But it can also have some educational benefits if students are getting some exercise early in the day. Douglas Park principal Gareth Sinton said the project also had other positive elements. “You don’t learn just to make yourself a better person – you learn to make the community a better place.